Cantor Margery Auerbach served as Bet Aviv’s cantor from February, 2001 through August 2014. Her goal as cantor was to encourage congregational singing and to enhance services with a wide variety of traditional and contemporary Jewish music. Singing and Jewish music have been part of Cantor Auerbach’s life since childhood. She learned to lead services before Bat Mitzvah age and studied Hebrew at a Student Zionist Organization Ulpan in New Jersey. She sang and was a soloist in choruses throughout high school and college, where she was a member of the Smith College Chamber Singers. She later sang with the Prince George’s Community Chorus and Zemer Chai, a Washington Jewish chorus. 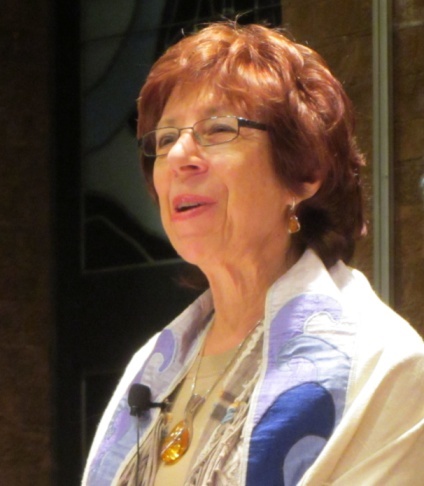 Marge began her cantorial career after thirty years as an educator. After graduating from Smith College with a major in education and a minor in music, she pursued graduate studies in education, receiving a Masters of Education and PhD from the University of Maryland. The transition to a professional cantorial career began when she and her husband joined Tifereth Israel Synagogue in Washington, DC, which uses volunteer cantors to lead all services. Soon Marge was leading Shabbat and High Holiday services. After study, she was able to fulfill her childhood dream of becoming a cantor, receiving cantorial certification from the Maalot Seminary in Rockville, MD in 1998. She also serves Am Kolel Judaic Resource Center as a Jewish Life Cycle Consultant, officiating at weddings, baby namings, Bar and Bat Mitzvahs, funerals, and other services. In addition, she has been High Holidays Cantor at Temple Emanuel in Virginia Beach, Virginia, and has served as guest Cantor in Conservative, Reform, and Reconstructionist congregations throughout the United States. Cantor Auerbach is married to Jim Auerbach, who served as Senior Vice President at the National Policy Association in Washington, DC, and is author/editor of books and articles on social determinants of health, industrial relations, and income inequality. He is a photographer whose images have been shown at numerous exhibitions, and has done volunteer photography for the Kennedy Center and many non-profit organizations. Jim and Marge are the proud father and stepmother of two grown sons and will be glad to show you pictures of their grandchildren, Jonathan, Cole and Sky.